Your online guide to Leelanau county, located in Northern Michigan. Also know as the little finger. summer seasons first car show. an awards ceremony at 3 pm. Lower Michigan is the "mitten" and Leelanau is the "little finger". Leelanau runs on a much slower pace than the rest of the world. 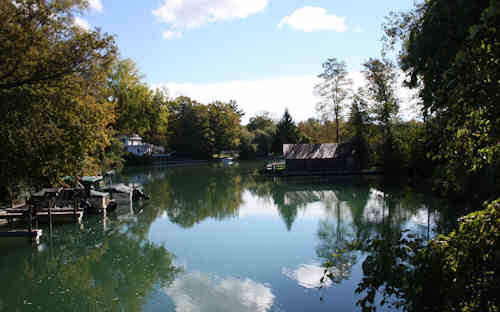 Leelanau's small rural towns and villages spread throughout the country side intermingling with acres of farm land, cherry orchards, grapevines and lakes. The county's name is said to be a Native American word meaning "delight of life" or as many of us call it "The Land of Delight". Leelanau has for many years been a place for The Family Vacation, between Sleeping Bear Dunes National lakeshore, skiing at The Homestead resort, playing on the beaches, swimming in the many beautiful lakes, summer bonfires roasting marshmallows, the local small town festivals or eating ice cream on a warm summer day. Though Leelanau has retained her rural feel through the years, Leelanau has grown up some. Leelanau is not just for family vacations. Today Leelanau hosts many top notch golf courses, award winning wineries as well as local events and festivals aimed at the mature audience. All in all, Leelanau County remains a favorite vacation spot for visitors young and old alike. For those same reasons, Leelanau is a great place to raise a family or retire. So come visit us and enjoy the miles of beaches, fantastic sunsets, hundreds of outdoor activities as well as some indoor activities.